We receive many enquiries from organisations that need to develop embedded systems in compliance with international safety standard ISO 26262. As an example of the type of design solution that we use in such products, we explore the development of a ‘Steering-Column Lock Controller’ (SCLC) that is to be used in a high-volume passenger car on this page. Our solution is based on a ‘Time Triggered‘ (TT) software architecture. 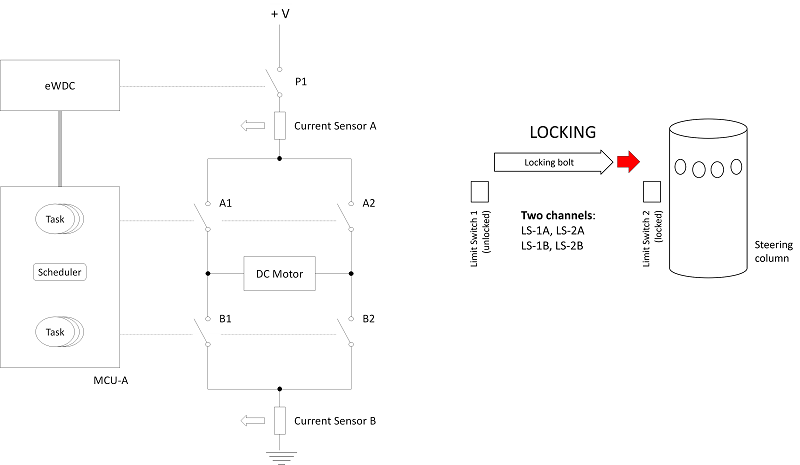 In the example explored on this page, we consider the development of a ‘Steering-Column Lock Controller’ (SCLC) that is to be used in a high-volume passenger car. The design is to be developed in compliance with ISO 26262, at ‘ASIL D’. The SCLC is intended to secure the vehicle when it is not in use. It is required to operate as follows. To secure the vehicle, a locking bolt is inserted into the steering column: when the vehicle is being used, the bolt must be fully removed. In our design, the locking bolt is to be positioned by means of a reversible DC motor. Turning the motor in one direction locks the steering column; turning the motor in the other direction unlocks the column. The motor is to be controlled by means of an ‘H Bridge’ arrangement. There are various possible design options for this system. One possible design is illustrated in the figure below: this is based on a ‘DecomposiTTor’ software platform. We have released a short public video related to this design example. The example presented on this page is based on a SafeTTy Solutions™ Package (SSP-RTL4).